Max Lockett of Berlin placed second in the junior division. 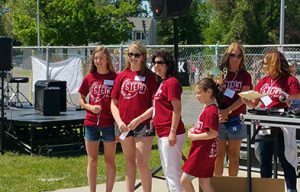 Tech Valley High School students’ cancer treatment research and an alternative fuel cell experiment took top honors at the Greater Capital Region STEAM Exposition. TVHS is proud to announce that sophomore Max Lockett of Berlin placed second in the junior division, and freshmen Jennifer Keller of Schoharie and Jennifer Ljutich of Germantown placed third. Lockett presented an oxyhydrogen gas generator. He created it in his chemistry class for a project about alternative energy technologies. Ljutich and Keller presented research and an experiment about how hydrogels are used in drug delivery for cancer treatment. Their work stems from a project in their bioengineering class. Who else presented on behalf of Tech Valley High School? Freshman Ian Jensen of Middleburgh presented the TVHS robot that competed the NY Tech Valley Regional FIRST Robotics Competition. Sophomores Macy Hayes of Menands, Brooklyn Darling of Wynantskill and Purevsuren Batdorj of Rensselaer presented about the impact of greenhouse gases. Sophomore Sean Collingbourne of Averill Park presented on redesigning combat helmets to reduce the risk of concussions. Juniors Robbie Scott of Coxsackie-Athens and David Kiefer of Catskill created a professional game demo. Juniors Seiji Akera and Kiam Kaiser of Berlin, Axton Pulliam of Berne-Knox-Westerlo & Nick Miller of Greenville presented their mechanical arm/electronic limb mapping project. They had won Best STEM Project at the Tech Valley High Expo on May 10. Junior Olivia Otero of Greenville presented about the science of baking cupcakes. Senior Stephen Wells of Guilderland presented about the science of self-driving vehicles. Jennifer Keller of Schoharie and Jennifer Ljutich of Germantown placed third. What is the STEAM Expo? 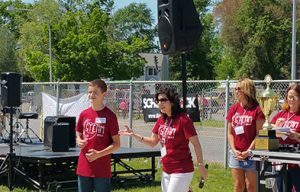 On Saturday, May 20, 2017, the South Colonie Central School District and Raiderfest hosted the 2nd annual Greater Capital Region STEAM Exposition at Colonie Central High School in Albany. Area students were invited to showcase their passion for all things related to science, technology, engineering, the arts, and mathematics but in a creative and artistic way.